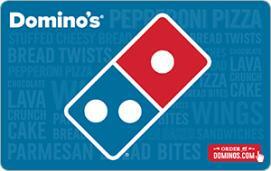 Earn 5.4 SB per $ when you buy Domino's Pizza gift cards at MyGiftCardsPlus, powered by Swagbucks. Dominoâ€™s is more than pizza! Try one of three varieties of stuffed cheesy bread, a delicious variety of Dominoâ€™s ArtisanTM specialty pizzas, Oven Baked Sandwiches, Parmesan Bread Bites, or Chocolate Lava Crunch Cakes. Order online at www.dominos.com for lunch, dinner, or your next occasion. Domino's Pizza is the recognized world leader in pizza delivery operating a network of company-owned and franchise-owned stores in the United States and international markets.